❶ Fast the same day flower delivery. Get a fresh bouquet in 2-3 hours! Fast the same day flower delivery. Get a fresh bouquet in 2-3 hours! Use the service of fast the same day flower delivery to save any holiday. Make an order on the website of the best floristic studio KROKUS or just call us on +371 200 303 06, and in 2-3 hours the courier will bring fresh flowers to the specified address. Our flowers same day delivery offers fast processing of orders, as well as fast and high-quality work of florists even at night. Besides, KROKUS realizes a festive and sunday same day flower delivery at the best prices in Latvia. How often did you find yourself in the situation when you accidentally forgot to congratulate a loved one on a holiday? You felt uncomfortable whether it was a birthday, a wedding, Christmas or the anniversary of family life. Suddenly remembering of the solemn event, you immediately ran to the nearest shopping center and tried in vain to find any present, remembering the tastes and preferences of the gifted person. But what if we can offer you the best solution to this problem? What about giving a luxurious gift to a loved one, even without leaving your home or office? You will say that this is fantastic, and we will answer that it is a reality! a wide range of flowers, bouquets and compositions for any holiday and celebration. How to find a flower shop same day delivery in Riga? Some customers wish to hand a bouquet to a gifted person themselves, so they ask a reasonable question: "Is it possible to find a shop in Riga (Latvia) with the same day flower delivery near me?" you can try to search "flowers delivery riga". In the case of KROKUS, this is not a problem. The matter is that our company differs in wide opportunities of courier service. During the years our logisticians have gained a colossal experience, which allows them to build correctly routes for delivering bouquets not only in Riga, but all over Latvia. You can order the address delivery of flowers, indicating the desired time, and the courier will bring you a fresh composition just on time. Besides, it should be noted that many shops in Latvia do not work on weekends. However, KROKUS can offer you a sunday same day flower delivery in Riga, which distinguishes us from the competitors. We work so that you can give a gift to a loved one on the day of the celebration, even if it coincides with the weekend. Order a bouquet of flowers in Riga and all over Latvia today! 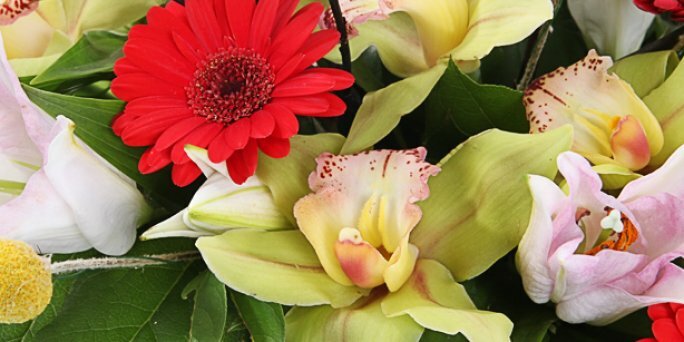 Take advantage of the delivery of flowers in Riga on the day of order! Make a purchase of a bouquet right now on our website, using a convenient form and payment method. Besides, you can get a free consultation on the choice of the composition, as well as the help in ordering, if you call the manager of the company on the specified number.